The Odyssey is in the news this week. 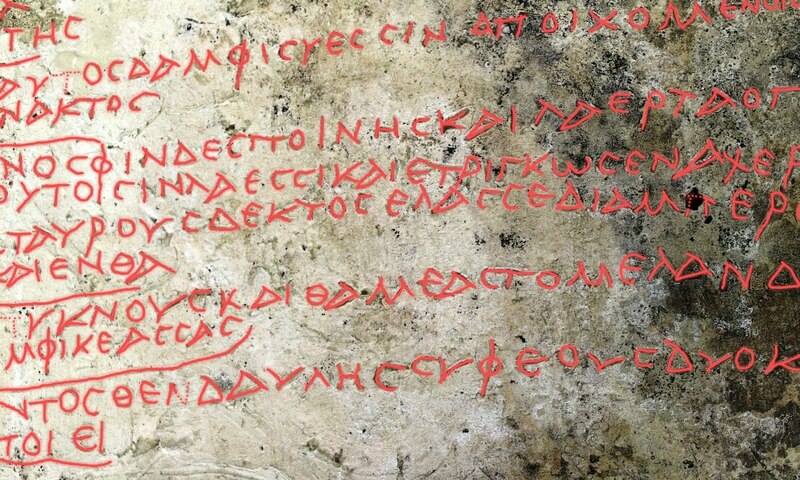 The media are reporting the discovery of ‘perhaps the oldest preserved written piece of the Homeric Epics that has come to light’ (‘ίσως το παλαιότερο σωζόμενο γραπτό απόσπασμα των Ομηρικών Επών που έχει έρθει στο φως’: press statement, Greek Ministry of Culture and Sports, 10 July 2018). It was found at Olympia, one of the most important religious sites of the Greek world, and the original home of the Olympic Games. The discovery is certainly important, and quite unusual. It isn’t written on papyrus, like most literary texts. It isn’t a verse inscription on stone, of which we have many. It’s a clay tablet. This was never a common writing medium in the Greco-Roman world. Its use for this tablet, and for this text, is something quite unique. The research project The Multidimensional Site of Olympia, led by Dr Erofili-Iris Kollia, head of the Ephorate of Antiquities of Ilia, deserve congratulations on their exciting discovery. But the most widely repeated claim -- that it’s the oldest copy of the Odyssey ever found, or even that it might be the oldest -- is dead wrong. The tablet misses out on being the oldest existing copy by some 700 years. Dr Kollia, regrettably, has also had her name mangled in the media. (The Washington Post calls her ‘Kolia Erofili-Irida’.) This is partly because the Ministry’s own press release misspelled her name in Greek, and partly because automatic translation tools have difficulty with possessive forms of Greek names. This was a really sloppy press release, and Reuters was negligent to disseminate it so gullibly. The most responsible handling of the story by any news outlet in the world, as far as I can see, is by the Italian newspaper La Repubblica. They realised that the thing about the date was untrue and contacted the Greek embassy in Rome about it. The response was that the tablet was the earliest copy of the text on a hard material. 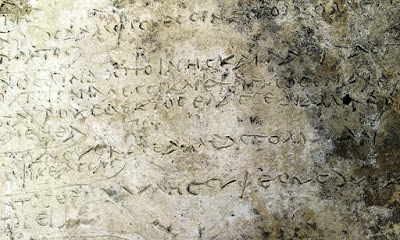 In a similar vein the Süddeutsche Zeitung casts it as the oldest inscription containing verses from the Odyssey. This might sound plausible, but it’s pretty obviously a case of someone scrambling for an excuse. Because the very earliest copy of any part of the Odyssey is incised on a 5th century BCE potsherd. ‘Potsherd’ means it’s a hard material. ‘Incised’ means it’s an inscription. Some news sources that have spread the false info from the press release: the BBC; the Frankfurter Allgemeine; The Guardian; Le Monde; The New York Times; The New Zealand Herald; Reuters; Time; The Washington Post. Some outlets that give a report with reduced misinformation: Archaeology.org; La Repubblica; Science Alert; Smithsonian.com; Die Süddeutsche Zeitung. Since there’s intense interest, here’s a transcription and translation. I’ve made them from the photograph that has been circulated in the press. Underneath is a version of the photo with the letter shapes highlighted. In my transcription the square brackets don’t represent edges of the tablet, as they normally would, but the edges of the photograph. 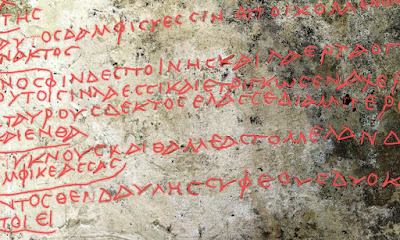 The tablet omits a verb in line 8, making lines 7-10 a bit of a jumble: it changes δείμαθ’ ὕεσσιν ‘(which) he built for the pigs’ into δ’ ἀμφὶ σύεσσιν ‘and around the pigs’. In line 10 ἐθρίγκωσεν, ‘he surrounded’, the tablet changes the aspirated θ to unaspirated τ. This is uninteresting from a textual point of view, but very interesting phonologically. It shows that either the scribe or the person who dictated the text was aware of the classical pronunciation of theta, as in tin. In the Roman era, when the tablet was written, θ was regularly pronounced as in thin, just like in modern Greek. But the standard text is secure: we’ve got ancient commentaries and a 3rd-4th century CE papyrus (no. 28 in West’s edition of the Odyssey, P. Rylands 53 fol. 13r) which both favour the standard text over the version in the tablet. Not to mention, the standard text actually makes sense. A complete list of ancient copies of the Odyssey -- not including this tablet, of course -- can be found in the introductory material to the recent edition of the Odyssey by M. L. West (2017), starting at page xxvii, headed Exemplarium antiquorum fragmenta (‘fragments of ancient copies’). There are something like a hundred that are older than the 3rd century CE, the date of the Olympia tablet. Some news outlets realised the claim was dubious and softened it. 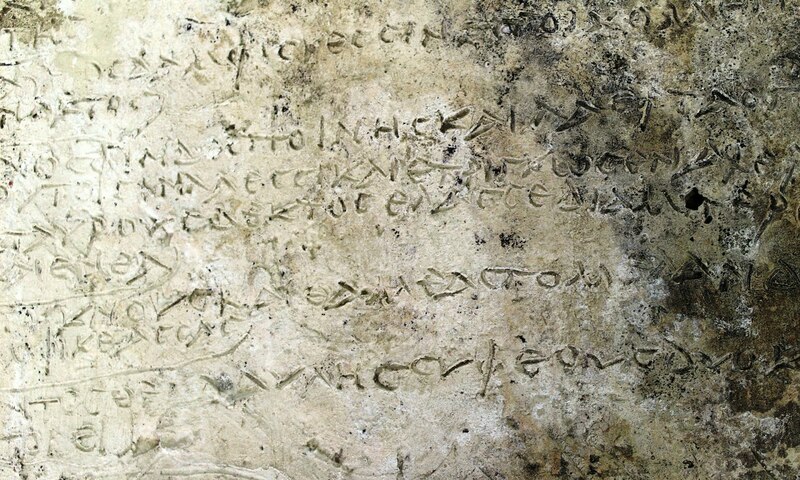 “If this date is confirmed, the tablet could be the oldest written record of Homer’s work ever discovered in Greece,” the culture ministry said. ... notwithstanding the fact that the softer claim is contradicted by the article’s title. Greece is not a good source of ancient papyri: too damp. The vast majority of our ancient copies of the Odyssey have come from Egypt, which has much better conditions for preservation. What about the purpose of the tablet? Why clay? ‘The Philological Crocodile’ has posted a suggestion that it’s a votive offering made by a rhapsode. That seems very plausible, given the find location at the temple of Olympian Zeus. It still poses some mysteries. Votive offerings with verse inscriptions are normally stone, or some object of personal significance. Also, the writing on this tablet is frankly sloppy: the lines are uneven, the line divisions and many letters are scrawled. If I had paid a scribe to make a votive offering for me and this was the result, I would not be happy. The choice of passage is also curious: why should the description of Eumaeus’ stockyard be apt, regardless of what kind of offering it is? I’m interested to see what ideas anyone has about these questions. In the passage on the tablet Odysseus does not address ‘his lifelong friend Eumaeus’, as the BBC and some other sources have put it. It’s a description of Eumaeus’ farm, and Eumaeus is Odysseus’ slave. The Odyssey does not date to the 11th century, and even the 8th century is a push. ‘The eighth century date is more often stated than argued for’, as Barbara Graziosi has memorably put it. The mid-7th century is a more likely date. While there was an oral epic tradition, that does not mean that a fluid Odyssean narrative was floating around waiting for someone to write it down and turn it into a canonical form. First, we can’t be sure when it was written down: there’s no guarantee that the seventh century date involved a transcription event. Second, the Odyssey feeds on many legendary narratives, including an Oresteia narrative and an Argonautica narrative, of which either, or more probably neither, may have existed in epic form. We can’t know that the story of Odysseus’ homecoming would have been at all recognisable in a hypothetical period prior to those influences. There is no evidence that the Greek alphabet was invented to write down Homer: that’s a fringe theory, and scarcely any Homer scholar outside the University of Wisconsin believes it. Thank you, Peter, for this judicious and informative piece. It is unfortunate that journalists, who for the most part know next to nothing about the subject, leap on stories like this because they seem to offer the shiny attraction of oldest, just discovered, newest etc. Such tags offer a brief, if mistaken, reason why we are supposed to be interested. It is a symptom of the need to compete for people's attention. Things that take years to learn and evaluate are not good for newsprint. On a point of detail, I am not sure that I should be so swift to dismiss the C8th dating. It has indeed been said to be more often a matter of assertion than argument, but then the same could be said of the lower dating. As you know, Richard Janko makes the case at length and in detail for an eighth century date for both poems. He did this in 1982 in HHH and defended it vigorously 30 years later in the Anderson and Haug volume on relative chronology (1992). It seems to me that this cannot be dismissed as assertion over argument. It might not be an argument that one likes and it might not be an argument that is very often made these days. But perhaps that is only because so many people are busy arguing for later dates. And those of us who accept the higher dating can do no better than cite Janko. But that is enough, I should be inclined to say. An argument is no less "made" simply because it involves adopting someone else's reasons. John Cottingham, the philosopher of religion, makes the point that what people find persuasive in his field study very often has less to do with a process of making incontrovertible argument from objective evidence and more with our own predispositions that lie below the radar of our rationality and inform where and how we use it. The same is, I think, true of Homer. Whether you salute Milman Parry, Adam Parry, Albert Lord and Richard Janko on the one hand or whether you are more attracted by those who argue for a lower date in the middle, or by Nagy and others who argue for a complete lack of early fixity ultimately has to do with one's evaluation of evidence. It is one of the mysteries of life how persons of good will, viewing the same evidence, can produce diametrically opposed interpretations of it. It keeps us busy. But I remember talking to Jasper Griffin about these things when I was a young man and he a middle-aged one. I talked at one point about historical "truth". His reply was,"I think, Simon, that your use of the word truth in this context such is, if you do not mind my saying so, rather cracked." I'm no postmodernist, and neither is he. But he had a point. I'm actually quite sympathetic to the idea of Janko's glottochronological approach - though it's also had its fair share of criticisms, as you know, like Brandtly Jones' piece in the Andersen-Haug volume and his piece in CJ 2010. My main problem with it is that while it's quite convincing for relative dating, its reference points for absolute dating are lacking. In particular Van Wees' dating of the Iliad by references to military practices is based on accumulative evidence, not selected tidbits, and I find that much more robust and harder to refute. Janko's method could do with a lot more calibration: I'd like to see a lot more stylometric analysis, not less! I've dabbled with it using rates of hapaxes and automated analysis with Patrick Juola's JAAGP tool, but alas I haven't been able to come up with anything productive. Beg pardon: JGAAP, not JAAGP. We know that Greeks (and Romans) wrote drafts on wax-covered wooden tablets, of which surely clay tablets could have been an earlier form. A commenter at Languagehat suggests that it is a schoolboy's record of a dictée, which would account for the sloppy writing nicely. Thanks. I thought there was a quote in P. Derveni, but was too lazy to look. αὐτὸς δ' ἀμφὶ σύεσσιν ἀποιχομένοιο ἄνακτος. But the δε in v. 8 is then pretty weirdly placed (as Armand D'Angour pointed out on Twitter), so something larger has probably gone astray. I had the sense that ἐθρίγκωσεν was meant to be the main verb, governing ἀμφὶ σύεσσιν in line 8. You're certainly right that it doesn't work at all well with that δ'! the Derveni papyrus has been found in Macedonia. Derveni is very close to Thessaloniki, which is in Macedonia, not in Thessaly. Thank you for this article and for the clear explanation. But, above all, thank you for the greek text!!! Thank you very much, especially for the textual analysis (and rubricked letters!). An observation from the full photo in the Greek press release: there seems to be a tenon on the bottom (partly covered by the cm stick) for insertion into some sort of base or stand. [I can't tell what's happening on top.] That suggests to me that public display was intended, as for a votive. But I'm concerned about findspot: we've not seen anything very specific, but I gather not from the Altis, so perhaps less likely to be votive (?). This looks like a very important consideration - if you're right, very strongly indicative of the tablet's function. Let's hope the official publication makes things a bit clearer! Thank you very much for this "mise au point". Media releases in France, Italy and Switzerlan are all so full of errors. Do you happen to know if the clay was fired, or is it hardened unbaked clay? It could make a difference for the interpretation of the artifact. Thanks for the great review of information so far. I would like to contribute a couple of ideas for the dating and the passage. 1) I work on Late Antique Peloponnese and I was very intrigued by the tablet, since me and some other colleagues we believe that the tablet lettering and style suggest actually a much later dating, in the 4th or better in the 5th c. AD. This of course would make the tablet a much more interesting artefact commenting on the late use of Homer, and the conditions of knowledge surrounding classical education in Late Antiquity. 2) The text is interestingly focused on peasant realities describing the pigsty of Eumaius, I would like to consider that it is also connected with the realities of rural Olympia more than the high style of intellectuals connected with the temple and the shrine. Thanks a lot for the clarification of the greek (and misinterpreted worldwide) news. I'm translating science news to Hungarian and always look for several different sources before publishing something, that's how I met your post which answered some questions I have asked while reading the misleading news on several sites. :) Thanks a lot!